← Man arrested for leaving toilet seat up………. This actually happened. Bear with me, it’s convoluted. Oh, and there is a multiple choice quiz at the end of this blog, so read carefully. Really. I received the letter pictured below (SSN redacted) from the IRS. It claimed I owed them $112.19 due to an amended tax form I submitted for my 2012 taxes. As it happened, we received a late W-2 (wage and income form) after I had calculated and sent in my tax return (we were due a refund). It came from some school substituting jobs my wife did early in 2012 which we had forgotten about. I, being the good fiscal conservative that I am, immediately amended my 1040, which revealed that as a result, I was due $112.00 less in refund than I had originally calculated. Along with the amended return, I sent a check for $112.00 and a letter of explanation why I had amended my filing. Fast forward to April 29th, the day I received this letter. Keep this date in mind, it’s important. The letter claimed I owed the $112, plus 19 cents as interest. Needless to say, I called the IRS (always a daunting experience). I had the cancelled check at the ready. After a 20 minute hold period I spoke to an IRS agent. I explained, she left the phone again for a few minutes, and returned to say yes, they had in fact received the money and all I owed now was the 19¢. 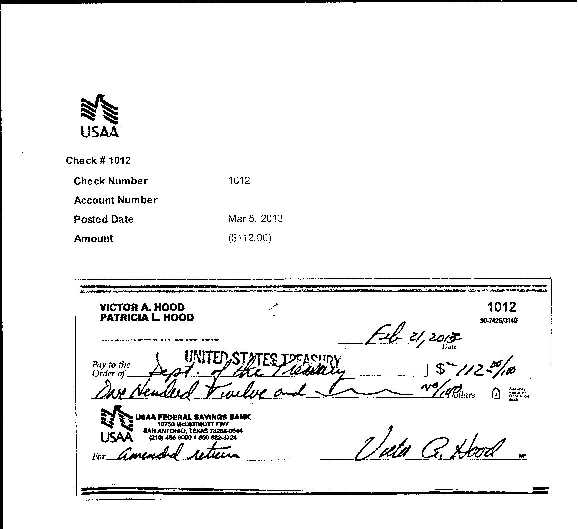 As you will see from the cancelled check below (acct #s redacted), it was deposited on March 5th (again, an important date to remember). I asked why the 19¢? 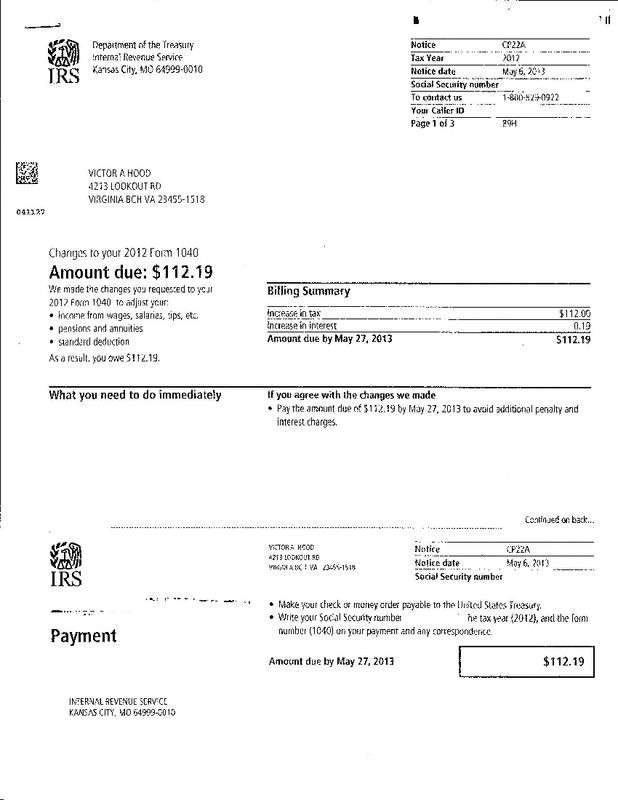 She responded, it was the late filing interest for the amount due (again, the $112) from the filing deadline of April 15 to the notice date of May 6th, 2013. I asked why, if they received my money in early March, they are still charging me interest from April 15th to May 6th (which, if you have been paying attention, is still several days in the future). And how did I get something in the mail on 4/29 with a notice date of 5/6 in the first place? Taking advantage of the fact that I was dumbfounded and speechless, the agent kindly suggested that I could go to the nearest IRS office (about 12 miles from here) to pay if I didn’t want to mail it in. So I did the math. To mail it: the cost of a check plus a 44¢ stamp, plus the 19¢ I didn’t really owe = approximately 65¢. Cost to go to the office: the 19¢ (I don’t really owe), plus $3.25 for gas (car gets 24 mpg -24 mile round trip-$3.25 per gallon) for a total of $3.44. If I choose the former, the post office and the IRS will use up x number of man hours delivering and processing the 19¢ payment. This, of course translates into a portion of each person’s salary which, hypothetically, is spendable income which will be put into the economic system with purchases. Those purchases will become someone else’s income who will make purchases, etc. etc. etc…… (this is your basic trickle-down economics). If I go with the office route, I will be contributing to the Gross National Product by using gas, creating man hours at the IRS office and further down the road, earlier than expected repair costs for my vehicle due to the mileage. Of course, this doesn’t even take into account the use of paper products and energy for computer usage which has to be manufactured by someone, right? By the time it plays out in the overall GNP it becomes a windfall. After hearing this sad story, which would you choose? 1. Fight this terrible injustice with righteous indignation! No way they should get your 19¢. Yes, your name will go on a blacklist and you will henceforth be subjected to an excruciatingly meticulous tax audit every year for the rest of your life (and all your descendants for their entire lives), but it’s the principle of the thing. 2. Write a very friendly letter to the IRS explaining their mistake oversight, and throw yourself on their mercy. Yes, you will still get audited for the rest of your life, but they will probably leave your descendants alone. 3. Mail them a check for 19¢ and enclose a copy of “Taxes for Dummies”. (May or may not result in audit, but probably). 4. Go to the local office to pay your 19¢, and ask them if they’re planning to take you to dinner and a movie first. 5. Happily mail in your 19¢, and feel good about yourself for doing your part in reducing the national debt. 6. Send them a check for $112.29, stating that they are the U.S. Government and could not have possibly been mistaken, and the additional 10¢ is for the interest accrued while you foolishly questioned their bill. Thank you. Your opinion matters. This entry was posted in Misc and tagged Gross National Product, Internal Revenue Service, tax return. Bookmark the permalink. Just don’t let them know if you’re a conservative. Are you volunteering to go to the IRS office for me? If so, I will sign a form listing you as my official representative. PS I’ve just noticed from your cheque that your name is Victoria 🙂 suits you better than Al. If it helps, my dads name is Patrick Joseph Mary. His parents just wanted to cover all the bases! That’s a funny story. My mother was really, really hoping for a girl (I had an older brother). She had picked out Victoria as the name. She had to settle for Victor A. It turned out to be just one of the many, many times I disappointed her. P.S. It’s a shame Johnny Cash didn’t know about your dad before he recorded “A boy named Sue”. Your dad could be famous now. My dad was dressed up as a girl until he was 2, but that happened to all baby boys in Ireland until that age, to stop the faeries stealing them! I expect there were quite a lot of boys named Sue. I love Johnny Cash, one of my all time favourite singers. He reminds me of my grandad except he was about 20 years younger… He looked like him & did his hair the same & always wore 3 piece suits. Between Boys called Victoria, Mary & Sue Johnny Cash could have had a field day! You do owe them $112 since you cancelled the cheque…. So you could send them that, and wait for the $111.81 overpayment refund…. Very funny! You know the IRS is looking for a few good men (and women). I’m sending them your email address……you’ll fit right in. I think I misunderstood your meaning of ‘cancelled’ cheque. Here we say that if we want to withhold payment however I think you meant you had a copy of the cheque that was cashed by the IRS… This means you don’t owe them anything. I’d personally make them take me to court over it 🙂 but then you knew that about me already! But you have paid it already! I’m beginning to think my readers are all geniuses. Can you imagine the havoc we could wreak if we pooled out minds together? I see your point about the trickle down, but the other side of this is that all the man hours the post office and the IRS are putting in on your return are at a great cost to me, the poor taxpayer. Your 19 cent bill is costing me $112.29! I’d prefer a money order. OK. I see where this is going. So I would need to send each of the 146 million taxpayers a check for $112.29 as well? How about if I just redact my blog? (You’re right, that is fun to say). I’d be tempted to send a cheque for $.019 in an envelope without a stamp of return address. Ah ha, John, I see devious minds think alike. I’d give you credit for this, but I don’t want you to be put on their blacklist too. You’ve been through this before, I see.